One of the main things in Italian cooking is the use of fresh ingredients, and that is the same thing you can expect from Calabrian food. A perfect example of this is Insalata di Polpo, otherwise known as Octopus Salad. 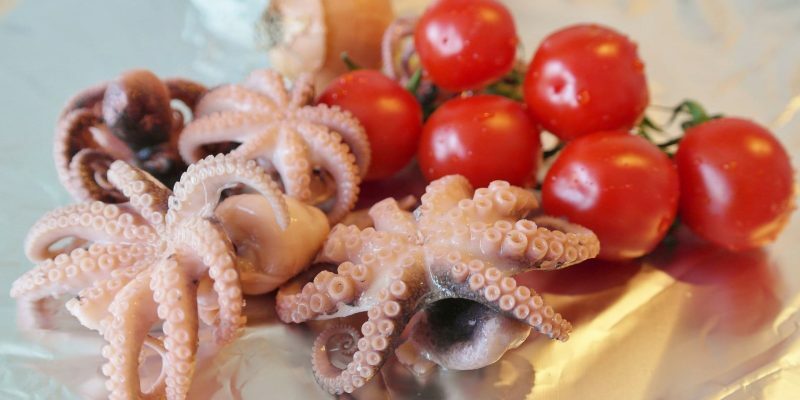 A prized seafood in Calabria, as well as in many Asian cuisine, octopus is one of the most popular ingredients in many traditional dishes in the region. And no, it is not the same as calamari, although octopus is indeed often confused with this other seafood. To clarify, calamari is a type of squid, not octopus. Although, both are cephalopods, the two are not actually the same creature. Also, octopus has long been considered to have a more delectable briny flavor and texture than squid. But aside from all that, octopus also has a lot of health benefits. What are these? Read below to find out. Much like most meats, octopus is loaded with proteins. And you need protein for building and repairing muscles and tissues. This means that octopus is good for the building and healing of bones. This element can increase energy, calms nerves, and helps relive muscle aches and spasms. An important component in many essential body processes, Vitamin B12 helps keep bones and red blood cells healthy. 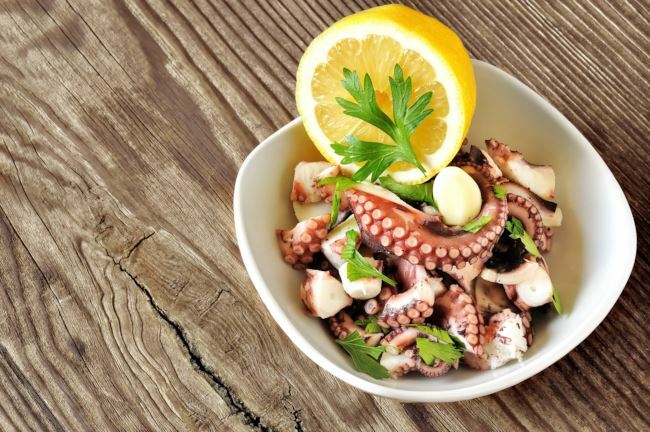 Other health benefits you ca get from octopus meat are Phosphorus, Potassium, Zinc, Copper and Selenium, all of which are essential minerals to the human body. When cleaning the octopus, remove the guts from the head, as well as the eyes and the beak. You can find the eyes above the tentacles while the beak would be underside and at the center of its head. 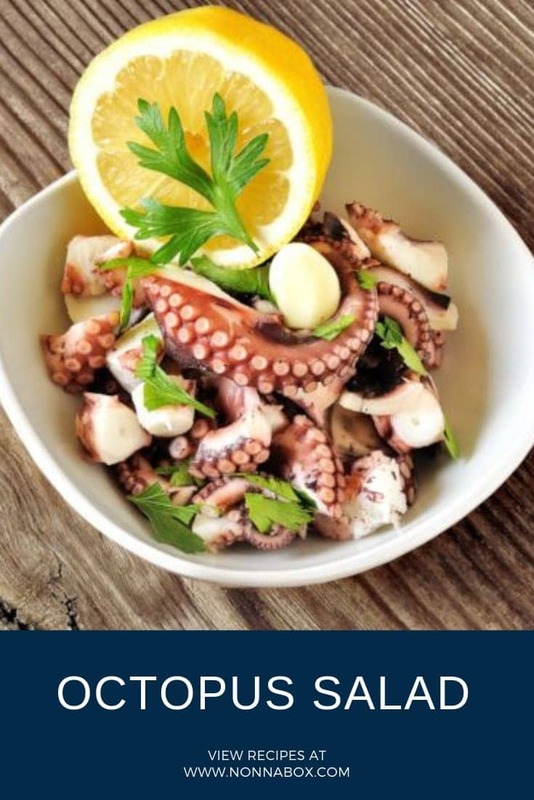 If you’re boiling octopus in water, either put the whole thing in boiling water for 1 to 2 minutes over high heat, or for about 45 to 90 minutes in low heat. Variations in length of time will depend on how big the octopus is. This method will tenderize the meat just enough. Another way to tenderize octopus is to marinate it. You can use a variety of ingredients for the marinade such as milk, yogurt, lemon or lime, kiwi fruit, or papaya. If you use milk or yogurt, marinate it for 2 to 4 hours. For lemon or lime, do it for about an hour. Make sure to not leave it for too long or you will lose all the meat’s lovely color. If you use kiwi fruit or papaya, however, you may have to marinate it for 4 to 6 hours. Yet another way to cook octopus meat is to chop it, put it in a bowl, and pour boiling water on it. Leave it immersed in the boiling water for a couple of minutes. Then marinate it according to recipe instructions. A popular marinade for it consists of extra-virgin olive oil, parsley, garlic, some salt, and lemon juice. Last method you can do to tenderize octopus is to do with it as you would beef or other meat you want to tenderize… go at it with a meat mallet. In cooking octopus, different methods will yield different results. Cooking it under 5 minutes will give you a chewy meat but with a pleasant texture. On the other hand, a long a slow cooking process will give you a tender texture, which can be best for most dishes. Keep in mind, however that cooking it too long may give you a dry, tasteless, and rubbery meat. So best avoid that, especially if you’re making octopus salad. 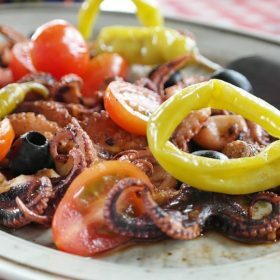 Typically served in Calabrian restaurants, the main ingredients of insalata di polpo are boiled octopus, herbs, spices, and some lemon juice. It is typically a summer salad and served as an antipasto. It also makes a perfect seafood dish for the holiday season such as in the Feast of the Seven Fishes. But you can totally also prepare it on regular days. In fact, it will make a delicious antipasto for almost any primo dish you can think of. How to prepare this yummy seafood salad? Find out below! Prepare this fresh seafood dish for an easy salad to serve on your table. 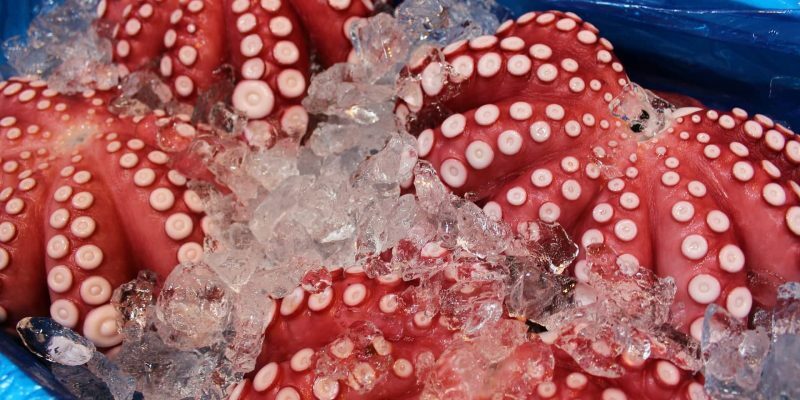 In a large enough pot, boil the whole octopus in a slightly salted water. Cook it for about an hour, or until meat is soft enough to be easily pierced with a fork. Once the octopus is cooked, drain the water and let the octopus meat cool down. Once it's safe to touch, cut the octopus into small pieces. Put in a bowl and set aside. Chop the onions, peppers, and parsley. If you want to add other vegetables, slice them into small cubes, too. In the bowl with the sliced octopus, add the lemon, extra virgin olive oil, salt, and pepper. Make sure to mix all the ingredients well. Next, add the chopped onions, peppers, parsley, and other fresh vegetables you want to add. Toss all the ingredients in the bowl. Let it sit in the refrigerator for a few hours before serving. It's important to let all the flavors blend before serving. Note: You can also add diced boiled potatoes to this salad and make it into an in insalata di polpo e patate, which is Octopus and Potato Salad in English. This salad is a traditional dish typical in the regions of Liguria and Tuscany.